Phytoplasmas are cell wall-less bacteria that infect plants when they are transferred via sap-feeding insects such as leafhoppers. Plants infected with phytoplasmas can show a range of defects. One of them is the well-known Witches’ Broom, a massive overproliferation of shoots, often seen in nature on trees and shrubs. Another common defect of phytoplasma infection is termed phyllody, which is a conversion of floral organs into leaf-like structures (Figure 1). This phenomenon is interesting from an evolutionary point of view as floral organs are thought to be modified leaves (Pelaz et al., 2001; von Goethe, 1790). Thus, phytoplasmas convert floral organs into something that resembles their developmental ground state. Figure 1. From MacLean AM, et al. (2014). PLoS Biol 12(4): e1001835. The molecular basis of phyllody is largely unknown but a recent paper by MacLean et al. (2014) has begun to shed light on the underlying mechanism. The authors elucidated how one effector of phytoplasma, a protein called SAP54 (MacLean et al., 2011), induces phyllody in Arabidopsis thaliana. Using a yeast two-hybrid approach, they found that SAP54 physically interacts with several transcription factors of the MADS-domain family, which contains many key floral regulators. Among them are the APETALA1 (AP1) and SEPALLATA1 to 4 (SEP1-4) proteins that have important functions during the onset of flower development and/or the specification of floral organ identity, respectively (O’Maoileidigh et al., 2014; Sablowski, 2010). How does the interaction of SAP54 with floral regulators of the MADS-domain family lead to phyllody? Given that plants with mutations in genes coding for certain MADS-domain proteins exhibit transformations of floral organs into leaves it appeared likely the SAP54 might render these transcription factors inactive. In fact, it was found that the MADS-domain proteins AP1 and SEP3 are less abundant in plants infected with phytoplasmas than in the wild type. This reduced protein accumulation appears to be a consequence of a higher rate of protein turnover because addition of a proteasome inhibitor resulted in a restoration of MADS-domain protein levels. This finding brought the authors back to the results of their yeast two-hybrid screen, in which they had also identified two RAD23 proteins as interacting with SAP54. RAD23 proteins are thought to play a role in directing ubiquitinated proteins for degradation by the 26S proteasome. Thus, SAP54 may bridge between components of the ubiquitin-proteasome system and floral regulators. That RAD23 proteins are indeed important for phyllody was shown through experiments in which SAP54 was ectopically expressed in plants. While SAP54 over-expression leads to a strong degree of phyllody in the wild type, the expression of phyllody is suppressed in mutants in which several RAD23 genes are disrupted. Similarly, infection of higher-order rad23 mutants with phytoplasma does not lead to phyllody nor to a degradation of MADS-domain proteins, albeit other aspects of phytoplasma infection, such as the formation of Witches’ Broom, are unaffected. Taken together, these data provide convincing evidence that SAP54 induces phyllody by targeting MADS-domain transcription factors for degradation through interactions with RAD23 proteins. What benefit does inducing phyllody in their host plants have for phytoplasmas? When male and female leafhoppers were given the choice between plants with normal flowers and plants that exhibited phyllody, they produced significantly more progeny on the latter. While the exact reason for this preference is currently unclear, it appears from these results that phytoplasmas modify flower architecture primarily to attract their insect vector to infected plants and thus ensure the spread of the pathogen. 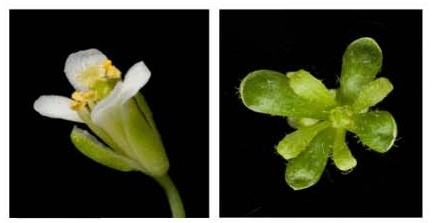 Figure 1: An Arabidopsis wild-type flower (left) and a flower from a plant after phytoplasma infection showing phyllody (right). Figure taken from (MacLean et al., 2014). MacLean AM, Sugio A, Makarova OV, Findlay KC, Grieve VM, Toth R, Nicolaisen M, Hogenhout SA. 2011. Phytoplasma effector SAP54 induces indeterminate leaf-like flower development in Arabidopsis plants. Plant Physiol 157, 831-841. MacLean AM, Orlovskis Z, Kowitwanich K, Zdziarska AM, Angenent GC, Immink RG, Hogenhout SA. 2014. Phytoplasma effector SAP54 hijacks plant reproduction by degrading MADS-box proteins and promotes insect colonization in a RAD23-dependent manner. PLoS Biol 12, e1001835. O’Maoileidigh DS, Graciet E, Wellmer F. 2014. Gene networks controlling Arabidopsis thaliana flower development. New Phytol 201, 16-30. Pelaz S, Tapia-Lopez R, Alvarez-Buylla ER, Yanofsky MF. 2001. Conversion of leaves into petals in Arabidopsis. Curr Biol 11, 182-184. Sablowski R. 2010. Genes and functions controlled by floral organ identity genes. Semin Cell Dev Biol 21, 94-99.
von Goethe JW. 1790. Versuch die Metamorphose der Pflanzen zu erklären. Ettinger, Gotha, Germany. This entry was posted in Uncategorized and tagged APETALA (AP1), Arabidopsis, floral regulators, MADS-domain, phyllody, phytoplasmas, RAD23 proteins, SAP54, Witches'broom. Bookmark the permalink.